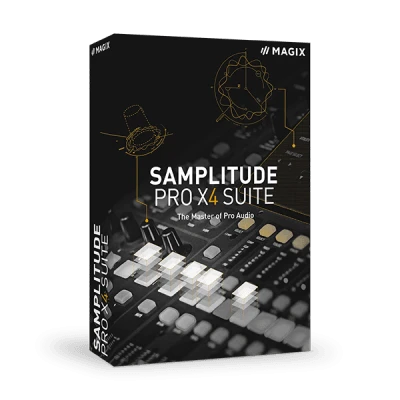 Samplitude Pro X Suite provides the highest level of quality for recording, mixing and mastering tasks, as well as for music production. With professional effects, efficient editing functions, as well as a powerful audio engine, the latest version continues to set new standards in the professional audio sector. The Suite is impressive with its additional features such as DDP handling and the full version of audio editor SOUND FORGE Pro 11. Comprehensive functions in the areas of editing and mastering make Sound Forge Pro 11 the perfect companion plug-in for Samplitude Pro X4 Suite. The powerful audio editor works on a precise, sample-based level and offers a premium selection of tools for mixing and finalizing your music productions. Pop Brass, Concert Guitar, Sansula, Upright Bass and Urban Drums. The spectral cleaning tool enables users to identify noise visually on a clip or object level and dampen or remove it. In addition, the Cleaning & Restoration Suite offers the cleaning effects DeClicker/DeCrackler, DeHisser, DeClipper and DeNoiser for eliminating clipping, crackling and noise from your audio files.